A research scope completed in 2014 shed light into the what had been termed as the “earliest known practical example of polyphonic music”. Pertaining to an inscription found on a British Library manuscript in London, the piece of choral music was judged to be composed (written) for more than one part. The scholars believe that this composition (comprising a short chant) dates back to around 10th century (circa 900 AD), and was dedicated to Boniface, patron Saint of Germany. 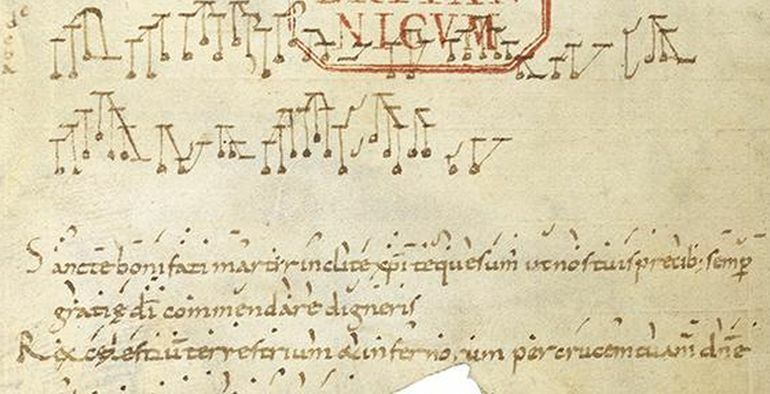 In essence it predates what was previously thought to be the earliest polyphonic music, from a 11th century collection called The Winchester Troper, by almost a hundred years. What’s interesting here is that we are looking at the birth of polyphonic music and we are not seeing what we expected. Typically, polyphonic music is seen as having developed from a set of fixed rules and almost mechanical practice. This changes how we understand that development precisely because whoever wrote it was breaking those rules. It shows that music at this time was in a state of flux and development, the conventions were less rules to be followed, than a starting point from which one might explore new compositional paths. 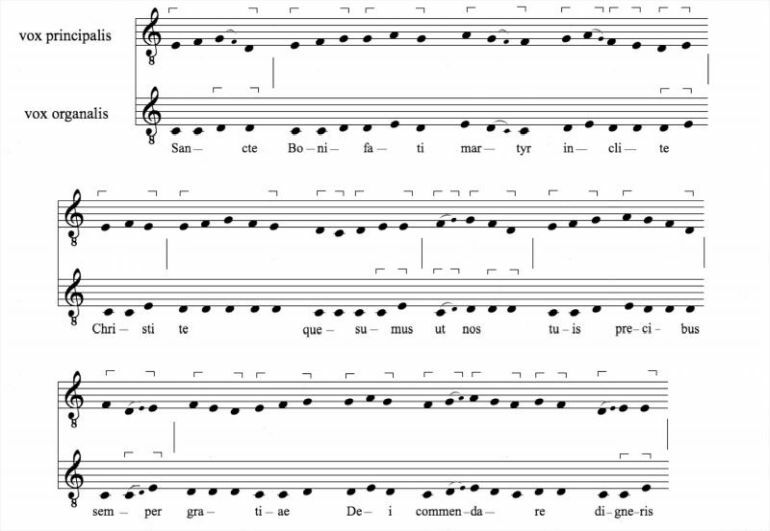 When I tried to work out the melody I realized that the music written above was the same as the one outlined by the notation used for the chant and that this sort of ‘diagram’ was therefore a two-voice piece based on the antiphon for St Boniface. The chant notation essentially gives the direction of the melody and when it goes up or down, the organum notation consistently agreed, giving us also the exact intervals for the chant. The music was added some time after the main saint’s life was written. The main text was written at the beginning of the 10th century, and on this basis, we can conservatively estimate that this addition was made some time in the very first decades of the same century. The rules being applied here laid the foundations for those that developed and governed the majority of western music history for the next thousand years. This discovery shows how they were evolving, and how they existed in a constant state of transformation, around the year 900. Source: University of Cambridge / The video shows the piece being performed by Quintin Beer (left) and John Clapham (right), both music undergraduates at St John’s College, University of Cambridge.